How do you make friends with someone so different from you? That’s the conundrum that Box and Circle have when they first meet. Like two little kids who bump into each other on the first day of school, they take to each other immediately and want to become friends. But these two sweet shapes have trouble finding common ground. Circle wants to jump! But Box can’t jump. Box wants to sit. But Circle simply rolls away. The two can’t seem to find something to bring them together. 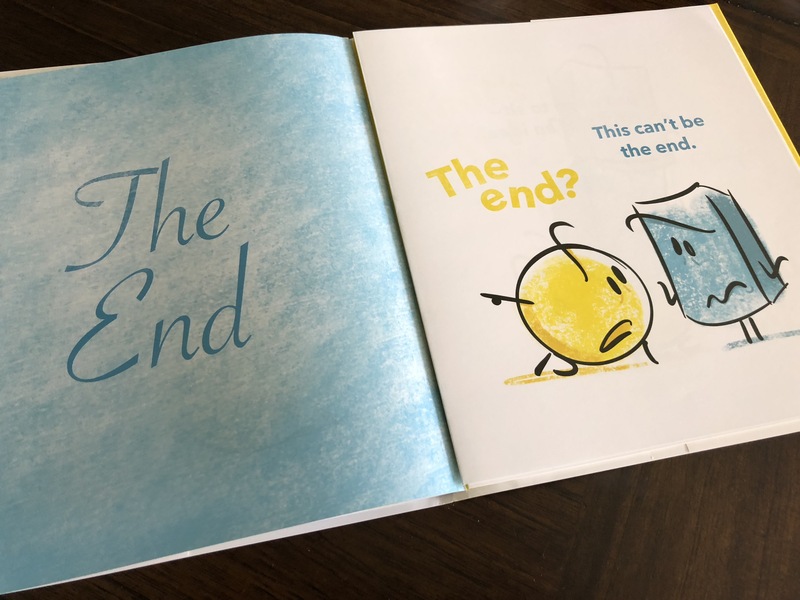 And the book says, “The End.” But Box and Circle refuse to give up and they come up with their own solution how to play together. Some might be satisfied calling this “The End” but not Box and Circle! Aaron Hartline finds a cute and clever way to tell a modern day parable about cooperation and compromise. When we think the story is at an end, these two geometric shapes push through and find a solution together. With so many people today setting a poor example of how different people can learn to get along, Aaron shows that it’s not that hard if we simply try. It’s a great story with a simple but important message, told in a fun way. Box and Circle like each other immediately, but they are so different. The artwork is simple but joyful. The minimal use of line is still incredibly expressive. Aaron’s artwork reminds me of a stylized Mr. Men and Little Miss book. And he crafts a good story that is easy to understand. It’s a great book for reading to your kids or have them learn to read with it. The book is the latest in the Pixar Animation Studios Artist Showcase series. Similar to the Walt Disney Animation Studios Artist Showcase, this one features artists from Pixar expressing their creativity in a different medium – books! Aaron has worked on some animated classics like Up, Inside Out, and Cars 3, and you can definitely notice some of those Inside Out influences in the book. This is a really fun book and perfect for bedtime story reading! Curious about the Walt Disney Animation Studios Artist Showcase Series? Read about Benson Shum‘s Holly’s Day at the Pool and Paul Briggs’ Catch My Breath. This book looks really cute, I’ll have to check it out!